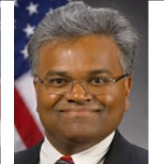 Mathy V. Stanislaus was confirmed as the Assistant Administrator for the Office of Solid Waste and Emergency Response (OSWER) on June 8, 2009. As head of OSWER, he oversees the Superfund program. Within the EPA, Stanislaus is one of many administrators who hails from the East Coast. Stanislaus has had a twenty-year career advocating for legislation and policy supporting brownfields redevelopment, Superfund enforcement and solid waste disposal. Stanislaus was born in Sri Lanka and immigrated to New York at the age of five. He now lives in New Jersey. He graduated from City College of New York and earned his JD at the Chicago Kent Law School in 1988. In addition, he holds a degree in chemical engineering. Stanislaus has worked as an advisor to other federal government agencies, Congress and the United Nations on several environmental issues. He started his career as assistant regional counsel in 1988 for the EPA in its New York regional office, focusing on the Superfund program and leading the implementation of the newly enacted Emergency Planning and Community Right to Know Act. In June 1994, as a member of United Nations Environment Programme - Environmental Advisory Council, he served as counsel to the United Nations’ summit that examined environmental issues affecting New York’s indigenous communities of the Haudenosaunee Confederacy, , as part of United Nations’ International Year of the Indigenous Communities. Stanislaus chaired a workgroup of the EPA in 1997 that investigated the clustering of waste transfer stations in low income and communities of color throughout the United States. Stanislaus co-founded and co-directed the New Partners for Community Revitalization, a NY non-profit organization that focused on the redevelopment of brownfields sites. He is a former counsel for EPA’s New York regional office, senior environmental associate in the environmental department of the law firm Huber Lawrence & Abell and CEO of Allegiance Resources Corporation, a small environmental consulting firm. He is a founding and current board member of the NYC Environmental Justice Alliance, Inc. Stanislaus has also led New Partners for Community Revitalization, a nonprofit that is dedicated to renewing New York City’s low- and middle-income neighborhoods by cleaning up brownfield sites, which are properties that cannot be used because of hazardous materials around them. He has also advised other federal agencies on the environment, and overseen waste-management programs as well. In his spare time, he is an avid gardener, golfer, and biker.